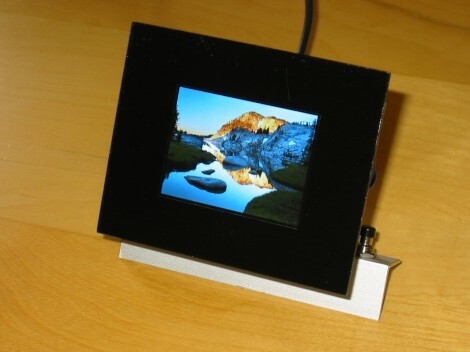 This digital picture frame physically rotates in order to match the image’s orientation. [Markus Gritsch] built the frame, including a Python script to translate the photos to a format which makes the best use of the 2.4″ LCD screen. The screen is addressed in 8-bit parallel by a PIC 32MX120F032B processor. Image are read from an SD card in a raw format, with 16-bit colors pushed to the display for each pixel. To get them into this format [Markus’] script converts the JPEG files to RAW, resizes them, uses dithering to reduce to 16-bit color, then applies a sharpening filter to improve the final look. During this process it also includes orientation information. That is parsed by the microcontroller and used to drive the servo motor to which the screen is attached. To finish off the project he spray painted a piece of acrylic to act as a bezel for the frame. Check out the demo after the break and we think you’ll agree the rotating feature, along with image scrolling, really makes this a piece you’ll want on your own desk. [Fergus Kendall’s] company is making development and breakout boards targeting electronic hobbyists. As with any endeavor that involves selling something, they need marketing. It sounds like [Fergus] was put in charge of getting some nice animated 360 degree images of each component. Instead of going through the drudgery of snapping frames by hand in a stop-motion-style, he whipped up a rotating platform that does the work for him. The brain of the operation is a Boobie Board, a microcontroller breakout board that is one of their products. 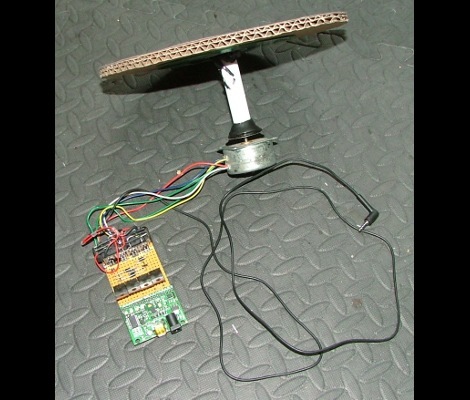 It controls a stepper motor attached to the cardboard platform via a quartet of power transistors. [Fergus] mentions in passing that their digital camera didn’t have a connection for a shutter trigger attachment. But they modded it to make things work. There’s no detail on that part of the hack but we’d wager that they soldered a transistor to the contacts for the shutter button. The stepper motor has 48 steps, so the hardware is programmed to take 48 pictures which become the frames of an animated GIF – embedded after the break – to show off the product. [Akeeh] posted something to our flickr pool that caught our eye. The image was a rotating POV display, playing pong. We followed through the links and found this very well done rotating pov display. The construction is quite nice, showing multiple colors and smooth motion. there’s a little bit of wiggle even though it has a custom round pcb. Maybe a little better counter weight would help with that. The idea isn’t new, but it is good looking and elegantly made.